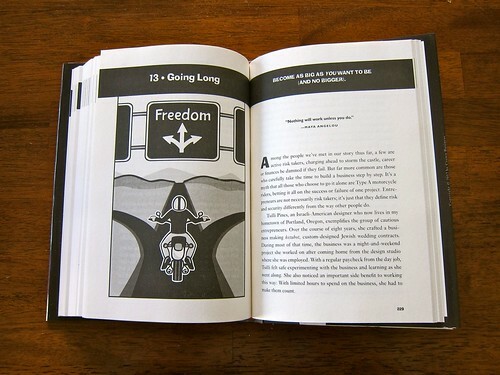 TODAY I was honored to see my article, Lessons from Illustrating the $100 Startup appear on Chris Guillebeau's Art of Non-Conformity (AONC) blog. Chris invited me to write a piece about how the illustrations were created and lessons learned through the process — of course I said yes! 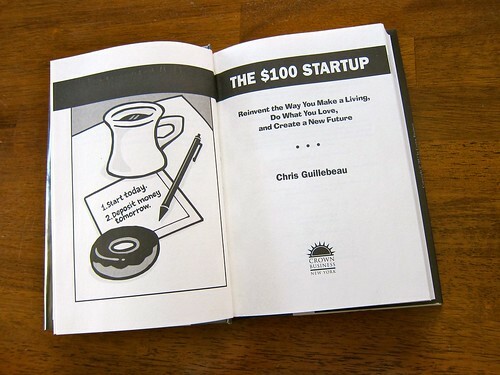 IN THE FALL of 2011, Chris Guillebeau reached out to me with a top secret project he was working on. 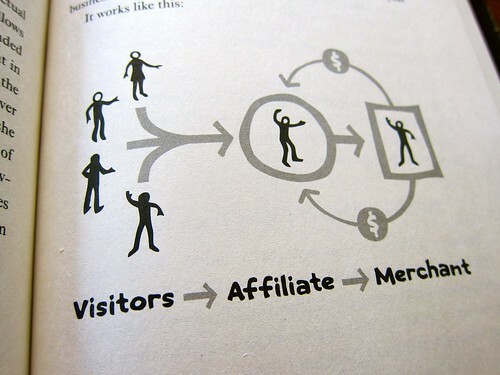 It was his $100 Startup book and he needed illustrations to amplify the words he was writing in the book. 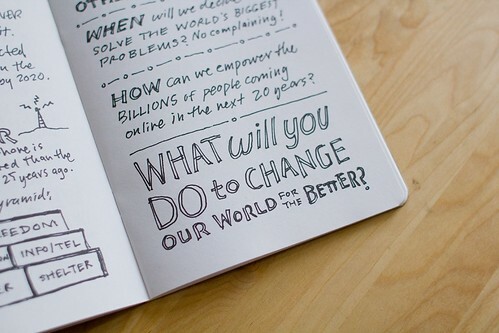 If not for my friend Jon Mueller at 800-CEO-READ, I might have declined the project, because at the time I was incredibly busy with multiple projects and was planning to write a book on sketchnoting. I’d known a little about Chris, his blog and his book, AONC, but it was Jon who highly recommended Chris’s book project. So, I decided to go for it. Go read the full article on Chris; AONC blog. Chris doesn't give out guest posts lightly, so I'm incredibly honored to have been featured on his AONC blog today. The $100 Startup is another great project I'm so proud to be part of because I think it helps people start businesses creatively, improving lives and offering new opportunities. 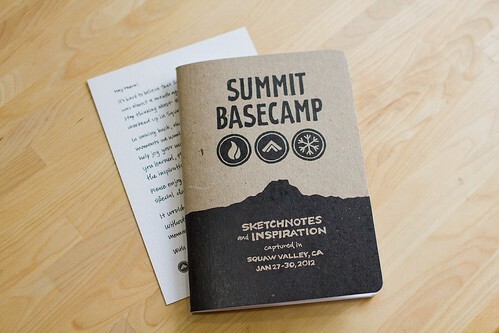 IN JANUARY, the Summit Series team commissioned me to attend and capture sketchnotes at Basecamp, a meeting of 650 invite-only guests in Lake Tahoe's Squaw Valley. I had a great time, met a variety of interesting people and enjoyed live-capturing my experience in sketchnotes during Basecamp weekend. 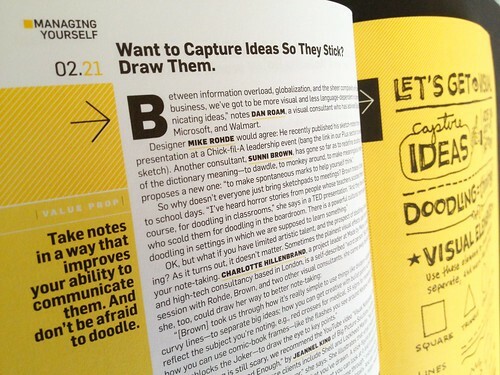 Typically, I post sketchnotes online, or create a PDF of the sketchnotes for attendees of events. 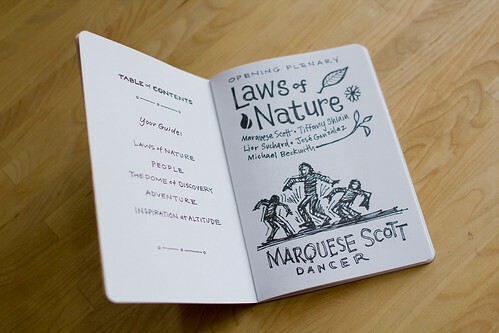 I this case I felt strongly that a booklet, created from the sketchnotes would make a great after the fact artifact of the event for the all of the Summiters at the event in Squaw Valley. 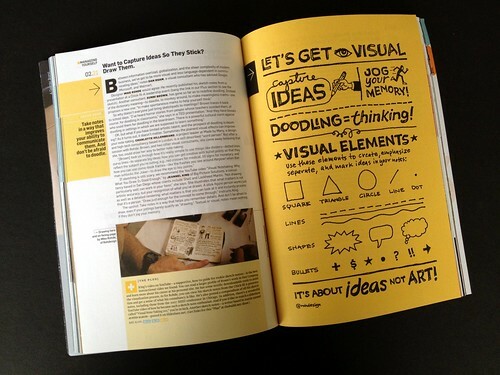 Audrey and the Summit Series team loved the idea so we began the process of designing a booklet from my sketchnotes. Using the multiple pages of sketchnotes I'd scanned, Audrey and I made typo fixes, adjustments and additions to the content, preparing it for printing. 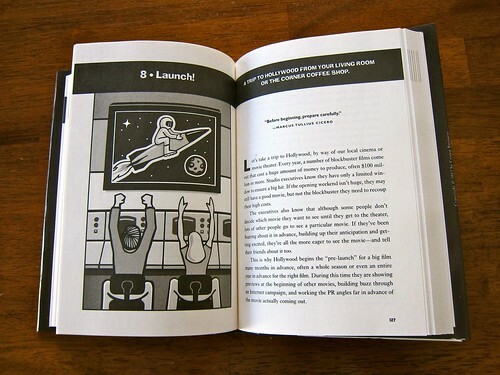 Laura, Lindsay and the Pinball Publishing team were my first choice, as they printed the popular Scout Book for our Visual Thinking 101 panel at SXSW 2010. 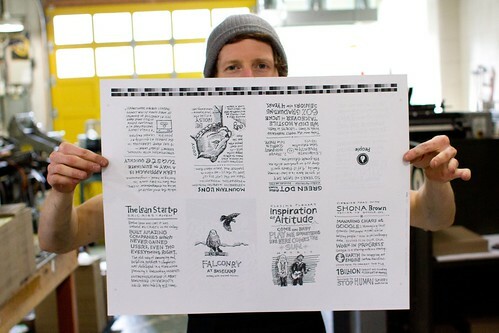 A Basecamp Sketchnote Booklet plate on press at Pinball Publishing. 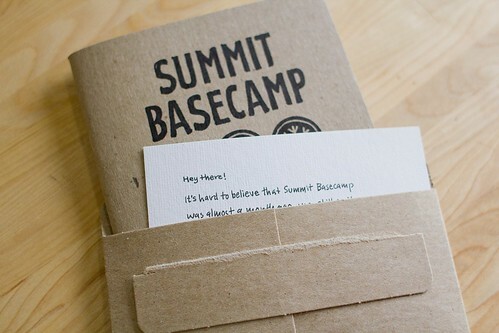 Basecamp Sketchnote Booklet signature sheet, fresh off the press. Cover and back cover signature press sheet. Audrey also provided a welcome note for the final packet, which I hand-write and scanned for print production. 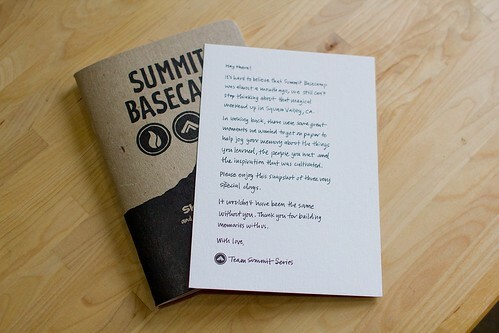 The note was printed on a single sheet of duplex card stock (light stock glued to kraft stock for the back), which was then placed into a kraft envelope for shipping to each Summit attendee. 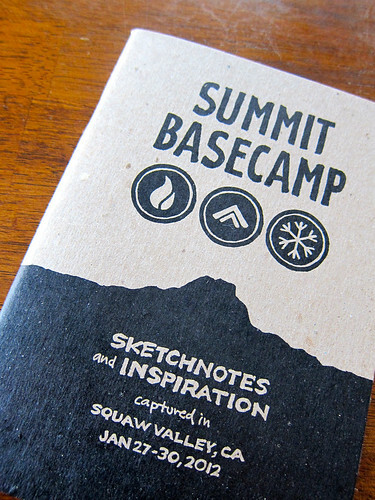 View: Virtual Summit Basecamp Sketchnote Booklet (flash required). The entire booklet turned out great! 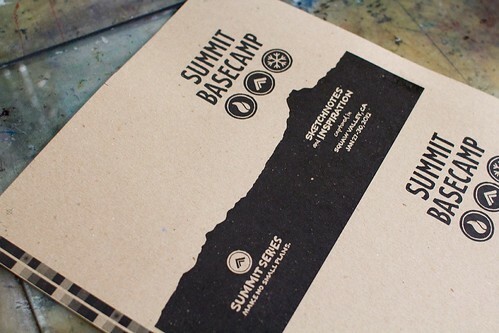 I'm excited to see how Summit Basecamp attendees like the final booklet — since our aim in capturing sketchnotes and producing a booklet from them is to remind them of their own great weekend experience in the mountains. 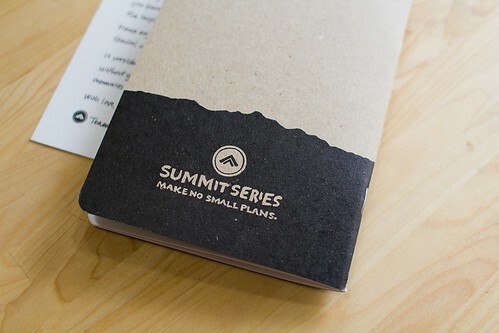 If you're a Summiter who has received one of these booklets. please leave a comment with your thoughts. 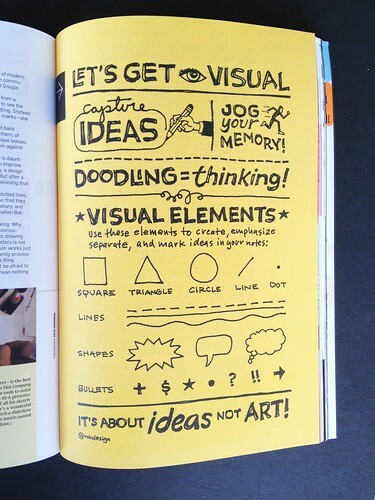 I and the Summit Series team would love to hear your feedback on this fun way of making an artifact from sketchnotes. Thank you Team Summit Series and Pinball Publishing for making it happen! 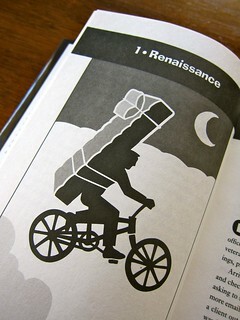 A BOOK ILLUSTRATION opportunity came along last September I could not pass up. 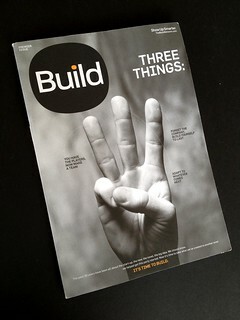 Chris Guillebeau reached out to me after seeing and hearing about my REWORK illustrations for 37signals and Crown. 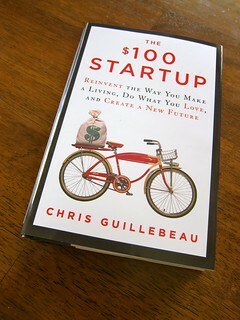 Chris was seeking my help in conveying the ideas in his second book, The $100 Startup, which just released this Tuesday. 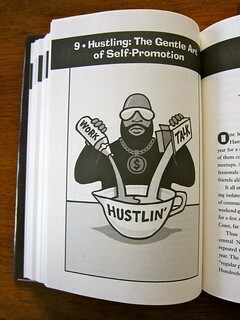 I accepted the project and had a great time working with Chris, bringing his writing to life with illustrations. 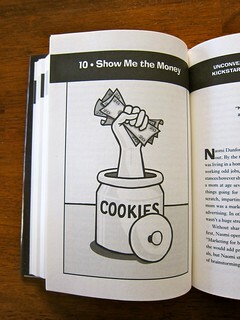 In celebration of the launch, I'm sharing a selection of illustrations from the book here. To see the entire set of illustration photos, visit The $100 Startup Flickr Set. 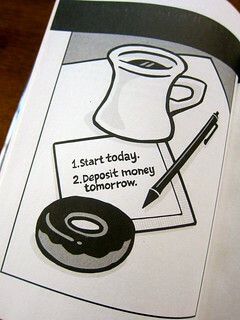 The best option? 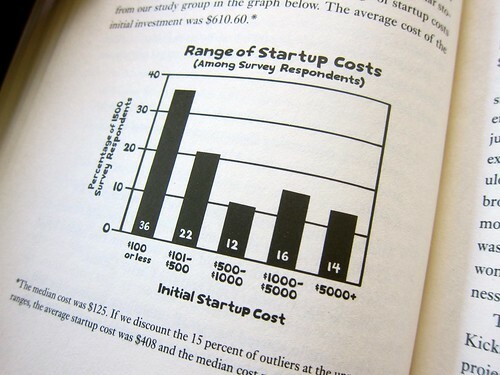 Buy your own copy of The $100 Startup — it's great book. 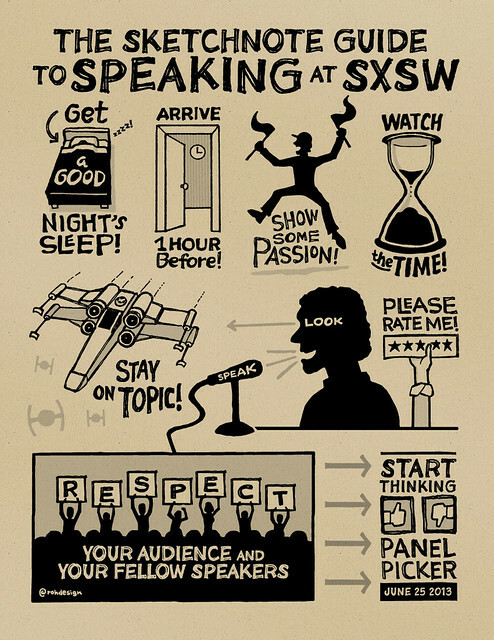 SXSW INTERACTIVE is one of my favorite events of the year, so when Shawn O'Keefe from the SXSW organizing team contacted me about creating a guide for speakers with sketchnote illustrations, I was all in. 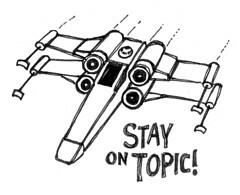 Show Your Passion for Your Topic - Have Fun! I began mulling these ideas over in my head and then moved to sketching out the concepts that appeared, using pencil and paper. 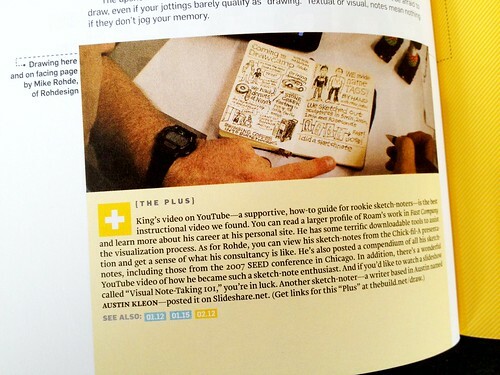 Each concept was sketched out for Shawn's review, with notes in the sketches and included in the Basecamp project we used to communicate. 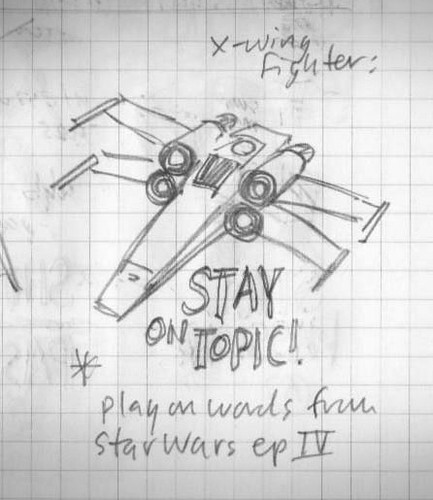 One of my favorite concepts was of an x-wing fighter from Star Wars (Death Star trench scene) related to the "Stay On Topic" recommendation. All 9 concepts were sketched out, reviewed and approved by Shawn and the team, so I began inking up the ideas. As I started inking the images, I also began thinking of the best way I could organize the 9 elements into a cohesive, logical unit, easy for a SXSW speaker to scan and understand. Each image was inked in my Moleskine sketchbook, scanned and edited in Photoshop. There, I remove dirt, fix contrast and generally optimize the images for their eventual vectorization. Finalized images were processed with Vector Magic, so I can easily work with the final vector elements in Adobe Illustrator. 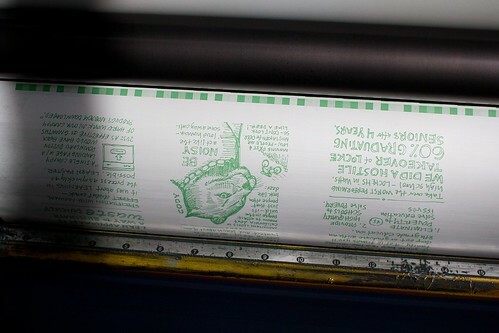 This approach lets me easily size images up and down without quality loss and creates excellent art for print production. I realized that re-ordering the images in a flow that would make more sense to a speaker was the right way to go — starting with a good night's sleep and ending with the Panel Picker to encourage speaking at next year's event. 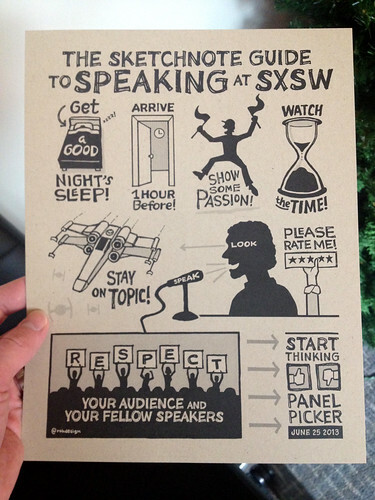 The speaker card will be inserted into every speaker packet, with the goal of better preparing all SXSW speakers for their panels. Thanks Shawn, Hugh, Caroline and the entire SXSW planning team for choosing me to communicate this message in a fun, unique way.